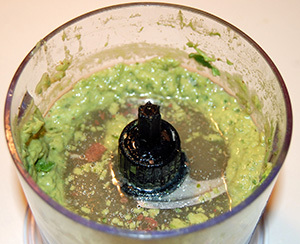 The avocado is a favorite PHD ingredient: it is a fatty subtropical fruit with a fatty acid profile similar to that of olive oil (only about 14% omega-6). Native to the Americas, its wild ancestor, a small, black-skinned berry, is still found in southern Mexico and Central America. The avocado has been cultivated since at least 10,000 BC, making it one of the first domesticated plants in the Americas. After the European colonization of America, it spread slowly: Wikipedia says it was introduced to Indonesia in 1750, Brazil in 1809, South Africa and Australia in the late 1800s, and the Levant only in 1908. Like all agricultural crops, the avocado has undergone extensive breeding. Over 80% of supermarket avocados are Hass avocados, which descend from a single “mother tree” on the La Habra Heights, California farm of mail carrier Rudolph Hass. Hass patented his tree in 1935. In addition to their excellent (grade B in our book) fatty acid profile, avocados are nutritious. They have 35% more potassium per unit weight than bananas, a diverse range of vitamins and minerals, and are fiber-rich: 78% of the carbohydrate in avocados is fiber, totaling 7 g of fiber per 100 g serving. 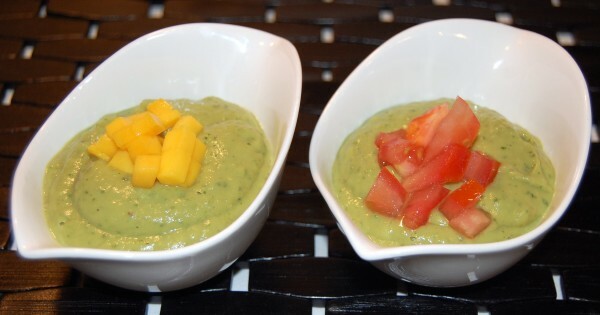 This chilled avocado soup is a great summer food. Because it is so fatty, it is best paired with low-fat foods, such as a white fish like halibut or cod, shellfish, and potatoes. Here is the recipe. Happy holiday weekend, everyone! A fatty summer soup to complement a low-fat meal like white fish, shellfish, or chicken with potatoes. Here is our pre-prepared bone stock, prepared the previous day and fresh from the refrigerator. It had gelled due to the high collagen content; 20 seconds in the microwave was enough to liquify it. 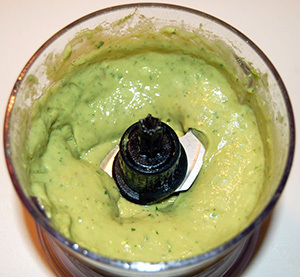 Except the tomato or mango which we'll use as a garnish, puree the avocado and other ingredients in a blender. Stir in the bone stock and blend a bit more. Add salt and pepper to taste. Chill the mixture in the refrigerator for 30 minutes. 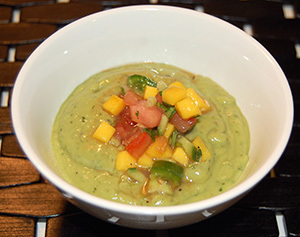 Distribute to serving bowls and garnish with diced tomato, mango, or salsa. For an Asian flavor, use basil in place of cilantro and add a drop of fish sauce. Delicious! This is perfect timing for me! I love having a cold soup ready to go during the summer. This one will be a great addition to my repertoire. I have all the ingredients on hand and will assemble it for dinner tonight! Thanks. Sorry. Our first try with this recipe plugin and it doesn’t put the recipe on the main page, only on the post page. Whenever you click through to the post (or comments), you’ll see it. Weird. The recipe became visible after my previous post. Nice, I like avocado too! Thanks, Paul. I thought there was a problem with my browser. By the way, the soup looks delicious. I will definitely try. So, one serving is something like a half a cup? Shou-Ching thinks so. I found it too rich to eat by itself but with fish and potatoes was great. 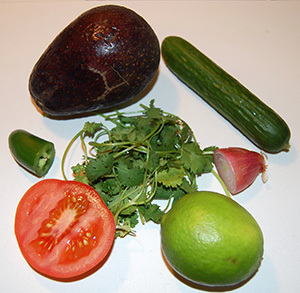 Fresh parsley and chives went in the food processor, and instead of plain onion I made a quick “relish” with red onion, cucumber, fresh mint, a little fresh orange & lime juice and a bit more diced avocado (and salt/pepper to taste). That really helped perk it up a bit. Having said that, it was yummy!! Ingredients don’t list jalapeños, but recipe and pics do? 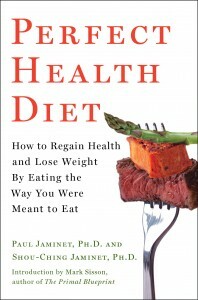 No, I would recommend taking no calories during the fast – not even oil or butter in coffee. 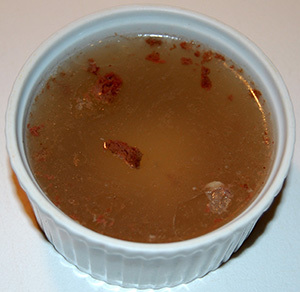 If you do eat something, you want salt and potassium and water, so you are thinking along the right lines, but a better choice would be a bone broth soup with diced vegetables and salt. Question: I have learned alot from my 60 year old cousin who lives on a farm in the middle of nowhere in Poland 🙂 He has taught me so many things that have been a way of life for them forever (when I first came to Poland in 1988 – it was like 30 years behind the US at that time). He said that I was not to eat beef fat in anything while drinking cold drinks – because the fat solidifies in the stomach via the cold liquid. He said when you eat something with animal fat – drink hot drinks (like tea which is what has been the traditional beverage at meals in Poland forever). What do you think? Hey Paul, I have a local doc (M.D.) that recommends not eating avocados due to the toxicity from the natural latex especially the unripe avocados that are shipped to the U.S. I typically eat avocados 3-5 times a week. Any health risks with that type of frequency? I always thought of avocados as a super food. Perhaps not? This looks delicious, and I’m always looking for ways to consume bone broth, other than hot, that are palatable because eating hot or warm food gives me hot flashes. I wonder if this would work as a rich dressing for an entree salad like one with chicken and potatoes like I’m planning for tonight. I have peaches so I’ll sub the mango. This also looks like it would be a great dressing for tossing potato salad instead of mayo, but I’ll probably try that with tarragon and lemon instead of lime and cilantro. I’ll be curious about the answer to the latex question. 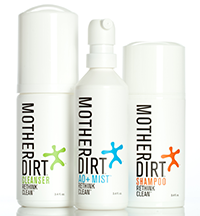 I have heard that the skin is quite toxic, but that’s it. I’m fortunate because an incredible organic citrus and avocado rancher comes to my farmers market with a wide variety of delicious avocados. Maybe I’ll even run that latex question by him.